The Arts Council Windsor & Region is turning 31 years old tomorrow! Founded in 1979 the ACWR became a non-profit organization to promote the arts throughout the area and has done so with great success through arts advocacy and the Artspeak Gallery. We’re having a birthday party, and you’re invited! Our annual Arts Schmooze event is birthday-themed to celebrate 31 years of ACWR goodness! Piñatas, summer-fun extravaganza raffles, delicious food, great music, and YOU = one super awesome party!!! And, if you want to join in on the piñata fun, we’ll be accepting artist-piñatas to either be smashed or saved for the night of the party. You can get started on making your own by following these simple instructions: http://www.wikihow.com/Make-a-Piñata. 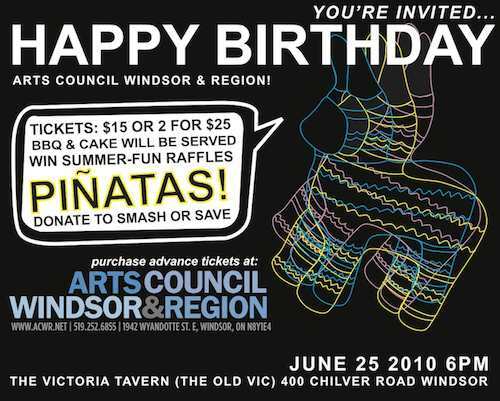 Then, drop off your piñata at ArtsCouncil Windsor & Region Headquarters (1942 Wyandotte Street East, Windsor)!